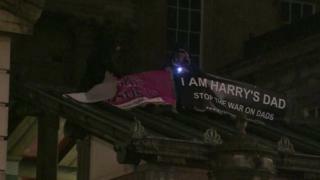 Two men have scaled the roof of a building at Buckingham Palace in a protest over fathers' rights. Martin Matthews, 48, and Bobby Smith, 33, used a ladder to gain access to the Queen's Gallery, at about 15:15 GMT, a spokesman for the men said. It is understood the Queen and Prince Philip were not at the palace. Scotland Yard said officers were called to a report of a protest at 16:28 GMT. The incident ended more than six hours later and two men were arrested. A Metropolitan Police spokeswoman said: "Officers attended and two males were found to have climbed on to the roof of the entrance at the location. "At approximately 23:00hrs, the two came down from the building of their own accord." The men sat on a roof about 18ft (5m) high at the entrance of the public art gallery, which is located on a road to the side of the main gate to Buckingham Palace. Two police officers - one armed - stood on an adjacent roof a few feet away, while a number of others were on the road. One of the men held a banner reading: "I'm Harry's dad. Stop the war on dads." The protesters' spokesman said the demonstration was part of a campaign by the groups New Fathers 4 Justice and Stop The War On Dads. They were campaigning over rights for fathers in divorce and separation proceedings and the reform of the family courts. Two men were later arrested on suspicion of trespassing on a protected site, the Met said.